Artist information page for Ken Taber. Ken Taber, born in Richmond, New South Wales, is a self-taught artist who paints impressionistic landscapes and seascapes. 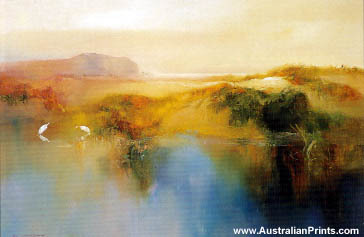 He started painting seriously in 1968 and his early years were spent living by and on the water around Pittwater, NSW. 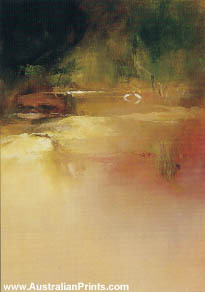 Since 1979, Ken has been developing his unique misty and romantic scenes, usually depicting lonely beaches or swamps, and readily acknowledges the influence of William Turner, Claude Monet and the early Australian Impressionists. He now lives on the South Coast of NSW, where the natural surroundings provide inspiration for his romantic morning beach scenes and misty backwater impressions.